To Sum It Up: Alexia Tarabotti is a spinster with no soul. Her touch cancels out the supernatural abilities of both vampires and werewolves, who normally recognize Alexia for what she is—preternatural. 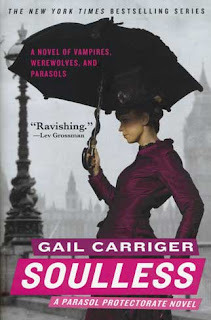 One unfortunate vampire, however, is unaware whom he’s dealing with when he tries to bite Miss Tarabotti, and she has no choice but to defend herself with her trusty parasol. The mystery vampire’s death leads to an investigation that uncovers some disturbing happenings among Victorian London’s supernatural population. Never one to shy away from danger, soon Alexia is in the midst of it, as her preternatural gift seems to have garnered the attention of some shadowy individuals. Review: I. Absolutely. Loved. This. I ended up reading the bulk of Soulless on Christmas, which could not have been more fitting because encountering so many of my favorite bookish elements in a single novel was like unwrapping one Christmas present after another after another. Victorian London setting. Sassy heroine. Swoon-inducing male character. Lively, witty banter. Copious humor. Paranormal creatures. Cool steampunk. And these are just the things I can think of off the top of my head! I love everything Jane Austen, and Soulless definitely evokes her works, from the writing style to the comedy. I laughed heartily and frequently while reading this, especially at how embarrassing our dear heroine Alexia’s family could be. Think Mrs. Bennet from Pride and Prejudice. Alexia, obviously, is the most sensible of the lot—smart, into books, and completely unafraid to speak her mind, even at the expense of propriety. I adored Alexia. She’s neither a shrinking violet nor your typical Victorian era lady. She walks around with a parasol that can double as a weapon in a jiffy if necessary. Her sharpest weapon by far, though, is her words. Rare is the occasion when Miss Tarabotti is at a loss for them. Not many can go up against her razor sharp wit except perhaps Lord Conall Maccon, Earl of Woolsey and Alpha of the Woolsey Castle werewolf pack. For whatever reason, the werewolves I’d read about in the past never left that much of an impression on me. Until now. Lord Maccon is an Alpha male in every sense of the word. Mmm . . . oh, right, I was writing a review. And oh my God—the verbal sparring that goes on between Alexia and Lord Maccon is priceless. They certainly have an Elizabeth Bennet/Mr. Darcy type of dynamic, albeit with much more rudeness and, uh, shenanigans that you won’t find in an Austen novel. I am so, so, so, so happy that I finally got around to beginning this series. Soulless is just perfect, even more so for its high-spirited heroine admittedly not being so. The secondary characters are just as wonderfully infused with life and poised to capture your heart. I’m thinking especially of Lord Akeldama, Alexia’s vivacious vampire friend, Professor Lyall, Beta to Lord Maccon, and Floote, butler to Alexia’s family and a bit of an unsung hero, if only for tolerating Alexia’s mother and half sisters. I could never fit all of the gushing I want to do over this book in a single review because Soulless deserves every superlative in existence. All in All: Winning in every way! I am officially obsessed with The Parasol Protectorate (and Lord Maccon). Soulless is the ultimate mix of everything I could possibly want in one book. Absolutely love this series. Alexia is a favorite of mine. Have you tried her Finishing School series set in the same world? I haven't read any of the Finishing School books yet, but now I want to more than ever! Alexia is such an awesome heroine- love her to pieces! Have you read the YA spinoff? She has another series coming out this year set in this world too. I love Carriger!! I can't get enough of these characters and this world. I think it's highly possible I'll get through all of her books by the end of this year! I think you would enjoy this very, very much! :D I'm absolutely LOVING binge reading the series right now!